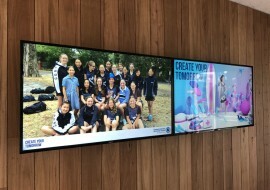 Peter Lalor Vocational College is a coeducational secondary school, serving years 10-12 in Melbourne’s Northern Suburbs region. 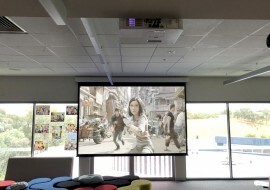 The IT team at Peter Lalor Vocational College reached out to Vision One to deliver a brand new, state-of-the-art audio visual solution for their existing Hall space. 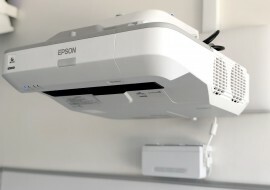 Mindful of cost but with uncompromising image quality the end goal, the Epson EB-G7500UNL 6,500 ANSI Lumens WUXGA Projector was selected to champion the installation. We threw the projector onto a Grandview 160″ Motorised Projection Screen, strategically positioning the screen between two exposed windows. An Audac audio system was installed, comprising of the following: 2x AXIR Column Speakers, 1x wall-mounted 10” Subwoofer with Bracket, 1x DSP Amplifier to manage audio reflections off the bricked columns, 1x Stereo Pre-Amplifier with in-built Bluetooth Receiver, 1x All-in-one Audio Source for CD, Radio, USB and SD and 2x Chiayo Handheld Microphone Systems. An HDMI and 3.5mm Audio Wall Plate was installed to the side of an equipment rack, granting both HDMI and iPhone/MP3 playback from the side of the Hall. We also supplied a BlueGum PSC75-S Post Style Lectern with Wireless Gooseneck Microphone in addition to a Kramer VIA GO Wireless Presentation Device. VIA GO gives iOS, Android, Chromebook, PC, and Mac users instant wireless connectivity with advanced presentation capabilities. The system is connectable via 3x powered HDMI Wall Plate points and is controlled via a custom Vision One JED T440 wall controller, offering users ON/OFF, VOLUME control and SOURCE selection functionality.